CNC machined from billet aluminum alloy (no die casting here). When you hold these in your hand, the top quality will immediately be evident. 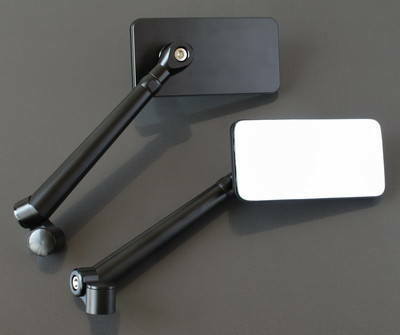 Available anodized black, gold, or silver. 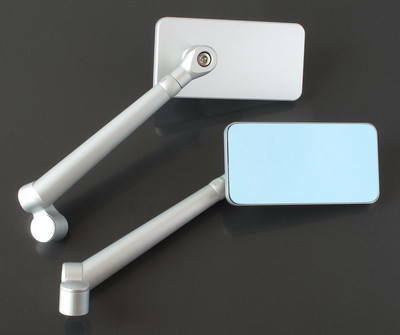 2 1/4 x 4 1/2" blue tinted convex glass mirrors offer a non-glare widened angle of view. Arm length is 150mm. Includes 10mm right and left hand threaded mounting screws. These will fit many new and vintage motorcycles. Please measure yours before ordering.